Slide hammer pullers from SPX Power Team make previously difficult removal of bushings, bearings, sleeves and other friction-fitted parts from blind holes a straight-forward task. A slide hammer or blind bearing puller is perfect for reaching the smaller, trickier fittings. So take a look through what’s in our range and find something specific to your requirements, whether domestic or professional. When you browse our selection you’ll quickly see that along with our blind hole pullers, there’s a number of slide hammer puller sets, reversible jaw hammer pullers, accessories and much more. Better still these are all available for great value prices and come with robust and reliable build quality. Basic Slide Hammer 1155 Compatible with internal pulling attachment. Compatible with threaded adapters. 610 mm length, 5/8"–18 threaded end and 2.3 kg hammer. Basic Slide Hammer 1156 1155 slide hammer unit with 1.1 kg hammer. Reversible Jaw 1176 1.1 kg hammer, 7241 two-way head and 34698 jaws. Ideal for pulling gears, bearings, outer races, grease retainers, oil seals, etc. Two or three jaws may be used and positioned for “inside” or “outside” pulling jobs. Both have 5/8"– 18 threaded end so attachments and adapters may be used. 2-Jaw set has 31.8 to 88.9mm inside spread and the 3-Jaw set has 38.1mm to 114mm inside spread. Reversible Jaw 1177 Same as 1176 but with 2.2 kg hammer. Slide Hammer with Cup Pulling Attachment 1157 Consisting of slide hammer No. 1156 with No. 1152 internal pulling attachment for removing oil seals, outer races, and bearing cups from blind holes. 102mm max reach and 38.1 to 152mm spread. Slide Hammer with Cup Pulling Attachment 1158 1157 but with 1155 2.2kg slide hammer. Pilot Bearing Puller 1170 19.1mm Reach, 12.7 to 38.1mm Internal Diameter Spread. These versatile pullers are built especially for inside pulling jobs, and particularly for removing flywheel pilot bearings on machines and construction vehicles. Also very practical for pulling motor, generator and magneto bearings. Pilot Bearing Puller 1171 25.4mm Reach, 22.2 to 54mm I.D. Spread. Pilot Bearing Puller 1172 44.5mm Reach, 12.7 to 50.8mm I.D. Spread. Slide Hammer Puller 1173 Ideal for pulling jobs in very close quarters, as in removal of small-bore bushings, bearings, oil seals, etc. Internal pulling attachment has jaw spread of 12.7 to 35 mm. Handle end has a 1/2"– 20 thread. Blind Hole Puller Set 981 With slide hammer, forcing screw, bridge, actuator pins, collets, and storage box. Removal of bearings, bushings, sleeves and other friction-fitted parts from blind holes can now be accomplished with ease. Set provides selection of expanding collets 8 to 44.5 mm I.D. Collet is placed through bore of part to be removed, then expanded with actuator pin so that lips of collet secure a positive grip for pulling. Pulling force is exerted by means of a forcing screw and bridge assembly or with a slide hammer. Slide Hammer Puller Set SS2 This very handy set is ideal for those close-quarter, inside pulling jobs. Very practical for pulling motor, generator, and magneto bearings. Also good for removing small-bore bushings, bearings, and oil seals. Slide Hammer Puller Set 1178 This useful set contains a reversible-jaw slide hammer puller with a 1.1 kg sliding hammer plus an assortment of special jaws (3 of each size) and adapters. In this set, you get all the versatility you demand of a slide hammer puller. Slide Hammer 22185 1.1 kg sliding hammer. Slide Hammer 34331 2.3 kg sliding hammer. Puller Head 1174 1174 Puller head, less slide hammer. 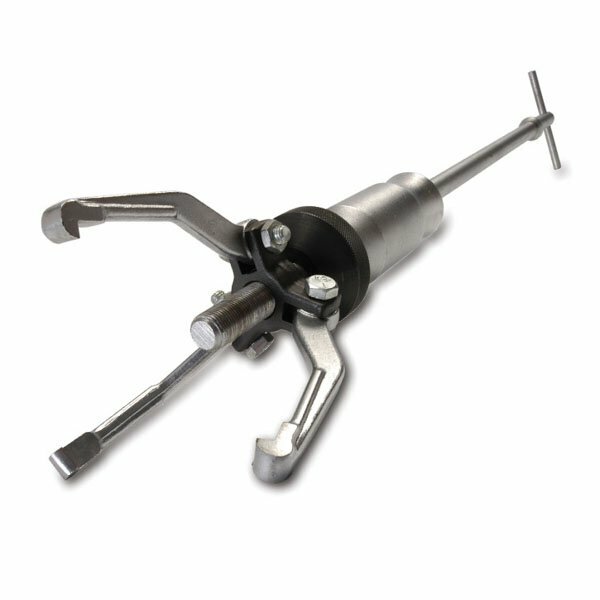 Universal Bearing Cup Remover 7136 The 7136 is perfect for pulling internal bearing cups, seals, bushings, etc. Jaw spread – 23.8 to 82,6 mm, reach to 88,9 mm. Use with any slide hammer having 5/8"-18 thread (Power Team 1155, 1156 or 927 Push-Puller). If you need some assistance on your purchases or you’re not certain which slide hammer kit or individual blind bearing puller is the right option for you, don’t hesitate to get in touch. The expert team here at SGS Engineering will be more than happy to advise you and let you know which blind hole puller, puller set or accessory you need. Otherwise, when you’ve found what you require simply place your order with us and we’ll have your new slide hammer bearing puller with you in next to no time. We also have generous warranties available on this range and free next day delivery when you spend over £50 on any of our slide hammers.